Nobita Nobi is a normal fourth grade student. This all changes, however, when a blue robotic cat appears from his desk drawer. Calling himself Doraemon, this robot tells Nobita that his future descendants from the 22nd century live in poverty because of all the mistakes he made. Therefore, they have sent Doraemon to serve as a guide and mentor to Nobita, so that their future may change for the better. What Doraemon comes to learn, though, is that Nobita is the weakest and laziest student in the whole school. To assist in his quest, Doraemon has a four-dimensional pocket with him, in which he keeps various machines and gadgets from the future. Unfortunately, these often result in even more trouble for Nobita. Will Doraemon really be able to achieve his mission of changing Nobita, or will he remain as he is? Clear all of your previous jaundice, because Doraemon is not as clear and transparent as it would seem on the surface; it should not be simply considered as another anime on par with the pace of all of the classics of anime. With its immensely large number of episodes, and the repetitiveness of its plot line in line with flat characters that hardly undergo any change, it is easy to assume that the anime is simply about the numerous different gadgets that Doraemon brought back from the future. To change your perspective, you only need an open mind, then you will see the truth as clear as daylight. To begin, as much as you wish to believe that Doraemon is about a ne'er do well named Nobita and how his life changed for good from the arrival of Doraemon, the plot of Doraemon actually revolves around the fact that Nobita is a boy suffering from a severe mental disability, and all of the characters, including Doraemon, are the product of his imagination. In real life, Nobita would be a little boy on his deathbed who imagined the entire series in order to keep himself entertained and to ease his pain and depression. From this perspective, the entire series of Doraemon now becomes a series about the different sensations of human life that the little boy would’ve felt had he not fallen into a mental disability. Every time Nobita becomes depressed in the story because he was bullied by Gian or Suneo, he is probably suffering pain from his mental disease; Gian and Suneo are simply the manifestation of his illness. Every gadget Doraemon pulls out of his pouch in order to save Nobita is a manifestation of something in real life used to relieve him of his pain; or rather, it may be the surgical tools of a doctor, since sometimes the gadgets cause him pain if Nobita goes overboard with them. The settings also provide concrete evidence to the truth behind the series. The mental capabilities of a child is much greater than that of an adult, yet it is not all powerful; it is not able to create objects that he has never seen. Therefore we see that the neighborhood inside Nobita’s imagination is very small, with a sparse number of houses and even more sparse the types of people that can be met. For example, we can only see Japanese people in the neighborhood, there is hardly any foreigners. Furthermore, when Nobita is walking around, we almost always only see blank walls, side-walks, and telephone poles; when Nobita is flying, we can only see the clouds in the sky and numerous trees and houses, with many of the same structural build-up. There are hardly any miscellaneous people or things walking around, in accordance with the fact that Nobita’s imagination can only support what it considers as important. Now, a little bit about the series itself. At this point, if you continue to believe that Doraemon is about how Nobita's life changed for the better because of the arrival of Doraemon, you will continue to enjoy Doraemon only as a remnant of a great series of memories, and possibly, a great childhood. However, considering the complexities of the plot as analyzed, Doraemon is actually a chilling insight to how the mind will react when driven to extremities of solitude. It is painful to consider how lonely and hopeless it must be for a child on his sickbed without being looked after by a friend, and possibly abandoned by his family for good. With this in mind, the boy now proceeds to indulge in escapism in order to run away from all of the emotional and physical pain that he is experiencing. We laugh at how silly it is, and gaze in wonder at the impressive gadgets that Doraemon can pull out of his pouch, yet behind the facade of happiness and wonder, behind the cover of the moral lessons, behind the desire and personality of an ordinary school boy, there exists a background of such darkness, such that in rereading the series, one cannot help but wonder at how strong a fortitude a child can possess. if only it would come true. A children's anime at best. I watched Doraemon as a child and as much as I loved it back then, I still love it now. Every thing is just cliche, but the endings are always so funny and classic. There isn't anything else I love more than watching Doraemon. I'm probably insane when my friends ask me what my favorite anme is, and I say Doraemon. but really, this is a good anime that teaches children lessons, and probably a classic if you enjoy classics. It's a long anime, sure, but worth it. Every episode is completely stand alone, and easy to pick up, easy to put down without being confused because there really is no story in each of them. A journey of growth requires more patience than we actually deem. Years and decades will pass, and one shall grow your manly or effeminate physique. One would grow and ripe into its prime, and one would think: I am not what I am before. To think that life is fleeting as a one-time exclusive sojourn, we cannot go back on the places we have went. The feelings of childhood remains, sometimes unfortunately being repressed in the deepest of slumber within our minds, and we seem to forget the sensations of childhood and its glory. We deem that the stimuli which titillate our puerile bodies cannot do the same with the matured. We deem that the child's favor of things is shallow and insignificant, but little did we recognize that there is nothing shallow nor deep; a thing is but a thing. And on a critique of something, we scrutinize our own experiences and perspectives; we look either at the rose-tinted lens of nostalgia, or with a naked critical eye. The world we see today is not the world yesterday, and thus we cannot derive our own judgments of what we had seen on that day. I may not see this show with glee today, because I am not that boy who have watched the show itself; but my mind tells me, that this show has a place in my heart, because the mind, the body, and the loins might have developed, but the soul, this heart of mine, is still the same as on that younger day. I cannot expound more as I cannot make my judgment as lucid as pure water. Doraemon has made my childhood, and nothing more. Doraemon is a cat... A Robot Cat from the future who is very, VERY HANDY at all times thanks to his Special Pocket on his stomach that has tons and tons of tools and equipment to use to solve everything that is a problem. Then, there's that spoiled little kid named Nobita, who is a very annoying little boy who always fails when it come to their school test and quizzes and what's worst is that, he is a very lazy kid and he has always been a victim of being scolded by his mother. In Doraemon's case. Nobita always wants to "borrow" something to Doraemon to do something silly, but Doraemon, most of the time, refuses to because he doesn't trust Nobita for doing something using his tools. But when Nobita sometimes baits him by giving him Doraemon's food, or when Nobita then throws tantrums, Doraemon has no other choice but to force himself to gave it to Nobita. But most of the time, even though Nobita is somewhat silly, he's still a kind person and he do his best to use Doraemon's equipment for good measures. 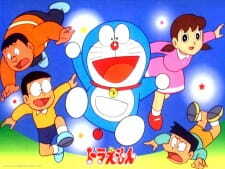 Doraemon (1979) is one of my childhood memories from early 2000s and this anime introduces me into the world of anime. When I was a kid, I always watch this show every morning, with the other anime line-ups after that, like Detective Conan, Pokemon, even the 90s animes like Voltes V, Dragon Ball Z and Daimos. Everyday, after that morning show which ends in around 8:30am, this anime is the appetizer for my Monday to Friday morning anime. Especially when my Mom is cooking for our breakfast, this anime is my waiting shed. Doraemon is very hilarious at times, nothing more and nothing less. It has also some important lessons of each episode which is great for all children to enjoy. Although I didn't watch the original Japanese Dub, the Filipino Dub version here in the Philippines is quite great though. Especially when one of the characters in Doraemon, Takeshi Goda, or Gian, is alias here in the Philippines is "Damulag", literally translates into "Giant" or "Water Buffalo", which is quite a hilarious name for the guy like him. Anyways, enough with the drama, if you saw this anime, whatever that time is... You better judge it yourself. This anime is awesome and funny... And I recommend you to watch this anime! I'll definitely say this anime is fantastically spectacular!